The easiest solution to power Raspberry Pi boards from batteries is to use a USB power bank, and if you want a neater solution, PiJuice HAT board is quite nice, but for something a little cheaper and available right now, Geekworm’s RPi PowerPack kit could be an interesting option with an acrylic enclosure, a battery board with a 3,800 mAh Lithium battery, a fan, three heatsinks, as well as a micro USB to USB cable. 3,800 mAh Lithium battery good for around 9 hours on the Raspberry Pi 3. Standard charging current / voltage – 1.0A/5.0V via 1x micro USB port. The kit with the 3,800 mAh battery is sold for $22.43 on DealExtreme. So this could work as a UPS? One would hope, but it’s not 100% guaranteed. I’ve seen some power banks take around one second to switch between charging, and running from the battery. Same kit but with Raspberry Pi 3 board included for $65 -> 8http://www.dx.com/p/raspberry-pi-3-battery-board-case-fan-heatsink-usb-cable-kit-435048?Utm_rid=93072394&Utm_source=affiliate, so that probably means the battery is really part of the board. Nope, no UPS mode possible since for UPS useage knowing battery capacity is a basic requirement and not possible here. You could only try to watch for voltage drops to trigger an emergency shutdown but if the step-up converters on the board always provide 5.1V until battery is empty this won’t work too. If you don’t know you’re running on battery you can not react. Thanks guys; seems like ATM forgoing SAYA & using a USB HDD + Pi (clone) + power bank is the cheapest/easiest route! “The kit is sold for $22.43” => can’t the ~same thing be achieved with a <1$ usb-lipo charger such as http://www.aliexpress.com/item/TP4056-1A-Lipo-Battery-Charging-Board-Charger-Module-lithium-battery-DIY-Mini-USB-Port-Free-shipping/1567407584.html ? You can just buy a cheap power bank with power “pass-thru” (or build one yourself) and connect a 5-3.3V regulator to the input of the bank (mains). The input can be safely fed to the SBC. A simple script monitors the GPIO pin and sets up a countdown timer to shut down the SBC safely before the bank drains. Simple and reliable. Ofc it helps. Simple & Awesome! There are different kinds of UPS. My UPS does not communicate at all with my computer, but when there’s a power failure it does the job, and I can manually turn off the computer. I agree that for server / gateway use, it’s much better for the system to know when it’s running on battery, and when it should automatically turn off and turn on in order to preserve data. Nice trick to use Ethernet to detect power outage. Battery level is obviously estimated, not measured here, so you need to make some tests and assumption to evaluate the battery life. Is there a way to know the battery level? Maybe someone familiar/interested could have a look to see how the script approximates the battery state? Since the link says this is GPL licensed I guess is could be put on Github, forked etc. That’s a C program (you need to look into the src directory). The battery time is set in a configuration file manually. 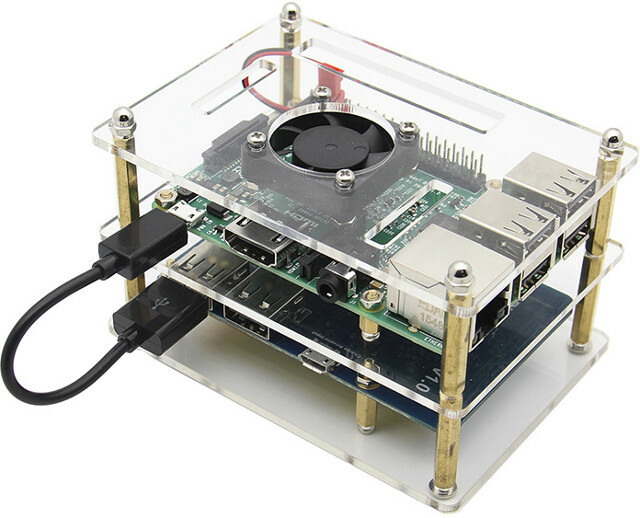 Do you know where I can find a similar acrylic case (UK or EU would be nice), where I can stack 3 or more Raspberry Pi? Same link on DX but for “Form Color” select “Transparent”. It costs $8.20. You can probably have it even cheaper on eBay. Can’t we find a work around for that like e.g to do checks for uptime (cron) and somehow try to reduce it? Would a software eqvivalent of a egg timer work, where number goes down when Ethernet off but builds up to set top limit when Ethernet on. Crude but would work, just needs adjusting to represent real charge time? @onebir only just seen your post on posting mine. @cnxsoft: Thank you for the links! but only charge this battery even if the switch is turned off, I think powerbank is better and sample. It’s always charging the battery. @zoobab Been wondering the same. Otherwise this isn’t much better than a battery pack. The board does not have that features, but it might be possible to add an ADC chip to monitor the battery voltage level.